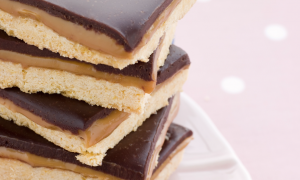 This months recipes were created by healthy recipe box brand Mindful Chef. These delicious nutritious meals, have been designed to make healthy eating easy. 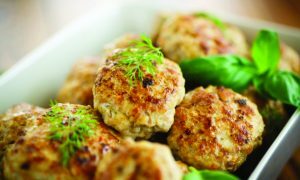 Both these vegan recipes are nutritionally-balanced, gluten-free, dairy-free and contain no refined carbs. Each recipe takes a maximum of 30 minutes to prepare. 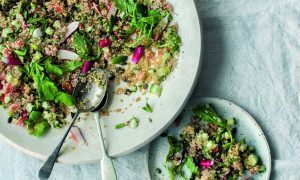 As with all Mindful Chef’s recipes, these tasty vegan dinners are nutritionally balanced and protein-packed to keep you full. All the ingredients used have multiple health benefits such as the turmeric sauce, containing powerful anti-inflammatory properties and the maple and protein-rich tahini drizzle, which is high in calcium for strong bones. Chickpea and coriander falafels nestled into a rich harissa spiced tomato sauce with a scattering of flaked almonds. The falafels are drizzled with a turmeric sauce, containing powerful anti-inflammatory properties. Preheat the oven to 220C / gas mark 7 and boil a kettle. Dice the onion and red pepper. Roughly chop the coriander. Heat a large pan with 1 tbsp oil on a medium heat and add the brown onion and red pepper, cook for 7 mins until softened. Meanwhile, drain the chickpeas. Reserve 1-2 tbsp of the liquid. In a large bowl, mash the chickpeas until they are all crushed, you can use a potato masher or a fork to do this. Mix in the chickpea flour, reserved chickpea liquid, sumac, half of the ground cumin and half of the fresh coriander. Season with sea salt and black pepper. Form the mix into 12 small balls to form falafels. Place the falafels on a baking tray and drizzle with 1/2 tbsp oil. Place in the oven for 15 mins until turning golden. Add the chopped tomatoes, harissa paste and remaining ground cumin. Season with sea salt and black pepper and cook for 15 mins until thickened. Meanwhile, make the turmeric drizzle; dissolve the creamed coconut in 30ml boiling water and stir in the turmeric with a pinch of sea salt and black pepper. 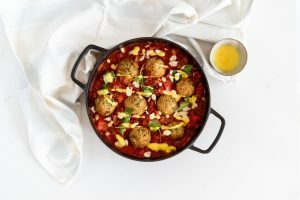 Spoon the tomato shakshuka into two warm bowls (or serve in the pan) and nestle the falafels into the sauce. Sprinkle over the flaked almonds, remaining coriander and spoon over the turmeric drizzle. Our veggie Pad Thai is made with courgetti noodles, richer in vitamins and lower in calories than rice noodles, with a peanut and lime sauce, full of Thai flavours. Finely chop the chilli and finely slice the spring onions, removing the root ends. Peel and slice the carrots into matchsticks and thinly slice the yellow pepper. Remove the ends of the courgettes, but leave the skin on. Prepare the courgetti noodles using a peeler and slice the courgettes into long thin strips (or use a julienne peeler or spiralizer if you have one). Drain, rinse and cut the tofu into 2cm cubes. Pat dry with paper towel. Heat a frying pan with 1 tbsp oil on a medium heat and cook the tofu for 5 mins, then add half of the tamari and cook for another 5 mins until golden brown, turning occasionally. Meanwhile, to make the sauce; mix the peanut paste with the remaining tamari, the maple syrup, the juice from 1 lime and the chopped chilli. Heat another frying pan with 1 tbsp oil on a medium heat and cook the carrot, spring onion and yellow pepper for 2 mins. Then add the courgetti and the sauce and cook for 3 mins. 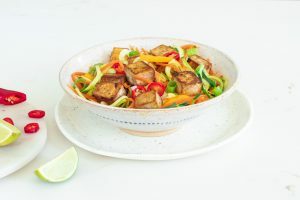 Serve the Pad Thai in two warm bowls, top with the tofu and drizzle over the remaining lime juice. A beautiful dish of roasted squash and baked za’atar spiced chickpeas, studded with pomegranate seeds, chopped pistachios and torn mint. Drizzled with a maple and protein-rich tahini drizzle, high in calcium for strong bones. Slice the squash into quarters, removing the seeds. Leaving the skin on, slice the squash into 1cm thick slices. Place the squash onto a baking tray, toss with 1 tsp oil and sprinkle with a pinch of sea salt. Place in the oven for 25 mins, turning halfway through, until turning golden and softened. Trim the tenderstem broccoli and slice in half lengthways. Slice the pomegranate in half and remove the seeds. Drain the chickpeas. Place in a bowl with the za’atar, a pinch of sea salt and 1 tsp oil. Spread the chickpeas out on one side of a baking tray. Add the tenderstem broccoli to the other side of the tray and drizzle of 1 tsp oil. Place in the oven for 15 mins. To make a maple tahini dressing; in a small bowl, mix the tahini with the maple syrup, a squeeze of lemon juice (to taste) and 2-3 tsp cold water to form a smooth sauce. Remove the mint leaves from the stalks and roughly tear the leaves. Roughly chop the pistachios. 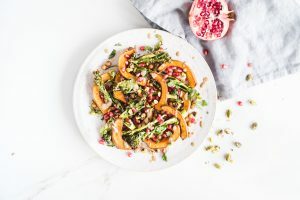 Arrange the roasted squash, spiced chickpeas and broccoli on two warm plates and scatter over the pomegranate seeds, chopped pistachios and torn mint. Drizzle over the maple tahini dressing.